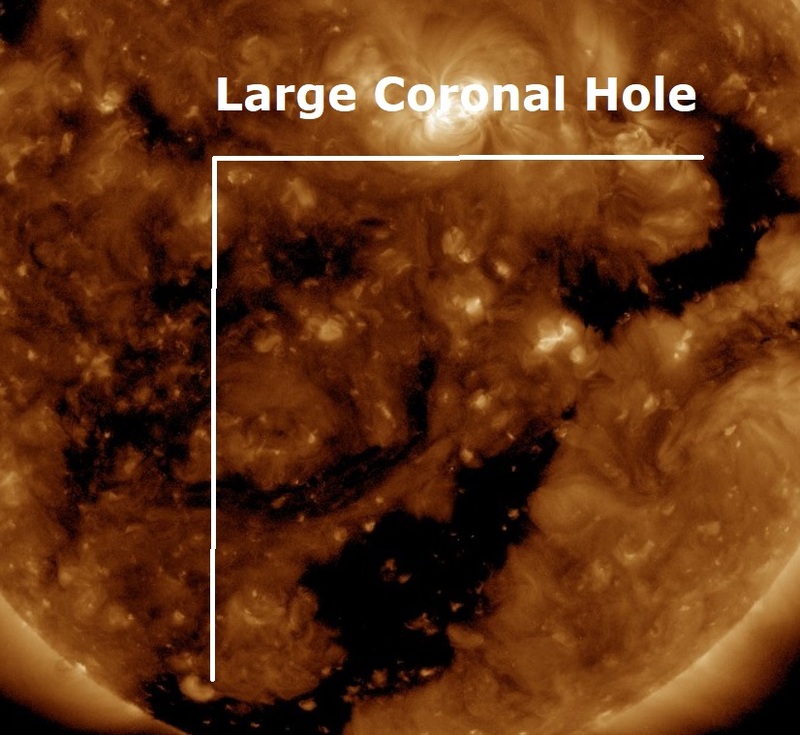 Earth is inside a stream of solar wind flowing from the indicated coronal hole, see above. A sprawling coronal hole on the face of our Sun is ejecting a high-speed stream of solar wind which is battering our magnetosphere which should reach speeds of 600km per second later in the day and this is causing magnetic unrest and auroras around the Arctic Circle. According to Spaceweather.com, the solar wind is flowing from a sprawling hole in the sun's atmosphere. Our planet should remain inside the gaseous stream for at least 24 more hours. 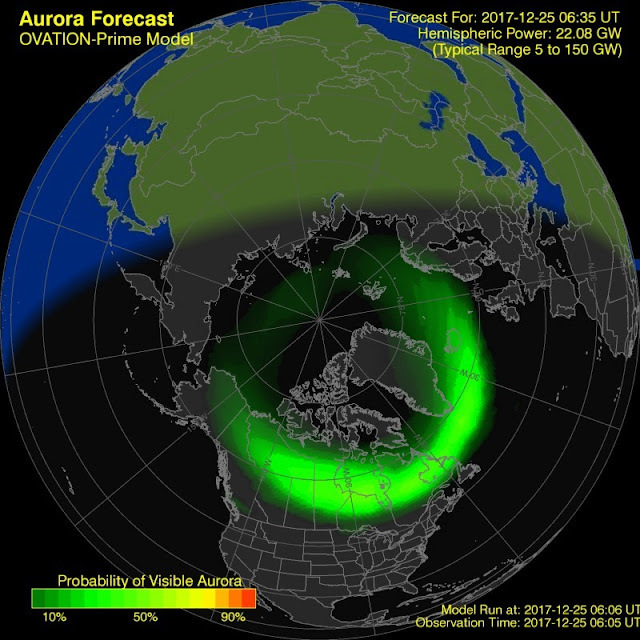 Arctic sky watchers may, therefore, expect auroras throughout the holiday. 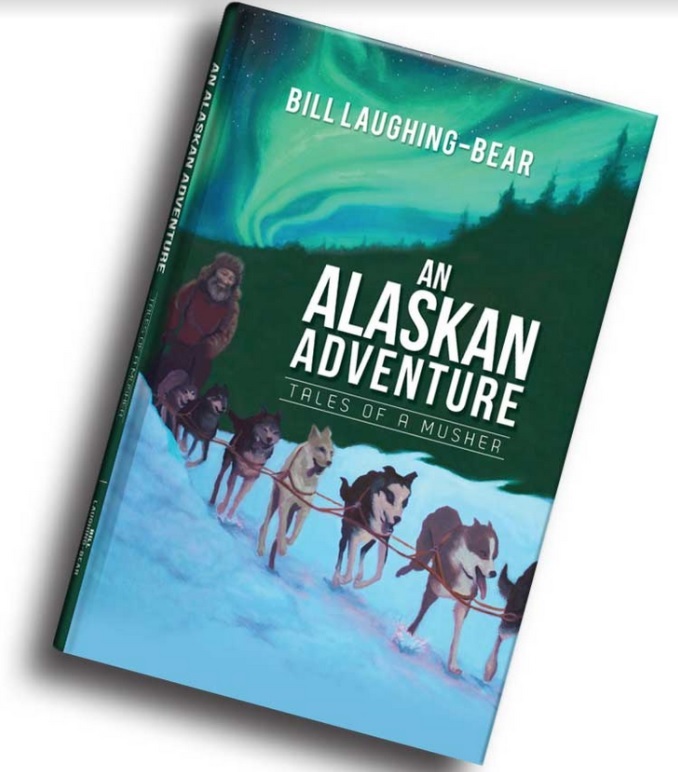 Regular readers of The Big Wobble will know solar storms and new and full moons are linked to causing seizures and migraines in people and dogs, behaviour problems in children and enhanced medical problems for people in Alaska. Got some interesting information to send your way, Gary, just more pieces of a huge puzzle. During the last solar storm that has been pounding the northern regions, I was contacted by another sled dog owner who had one of her dogs experience its first seizure which lasted a couple of minutes. This event happened in conjunction with the solar storm and the new moon which drastically affects the ionosphere. The dog was taken to a vet and given a complete battery of tests that revealed absolutely nothing wrong that would bring about a seizure. The dog was given a perfect bill of health. At our Deadhead TBI (Traumatic Brain Injury) meeting, 100% of all the members there had been battling either seizures or cognitive function problems such as memory, dizziness or migraines. One member who has a Vagus Nerve Implant (Vagus nerve stimulation is a medical treatment that involves delivering electrical impulses to the vagus nerve) said that, according to his doctor, was adjusted perfectly for prevention of his seizures. During that and other storms he gets shocked constantly so often that it is brings him severe pain, makes him jump, and if he is speaking at the time of a shock, it altars his voice. He does not battle this problem when there are no new moons, full moons or solar storms. There is no doubt in our minds that there is a definite link here. I am noticing that during these events my Siberian sleddogs sing more often than usual. For myself, I am finding that when I have the combination of a new moon and solar storm I am pretty much shut down, unable to function and stay at home. For whatever reason, the new moon - for me - is worse than the full moon. We hope Bill gets his wish for a special computer soon so he can personally dig deeper into his research, finding connections between planetary alignment, solar activity.